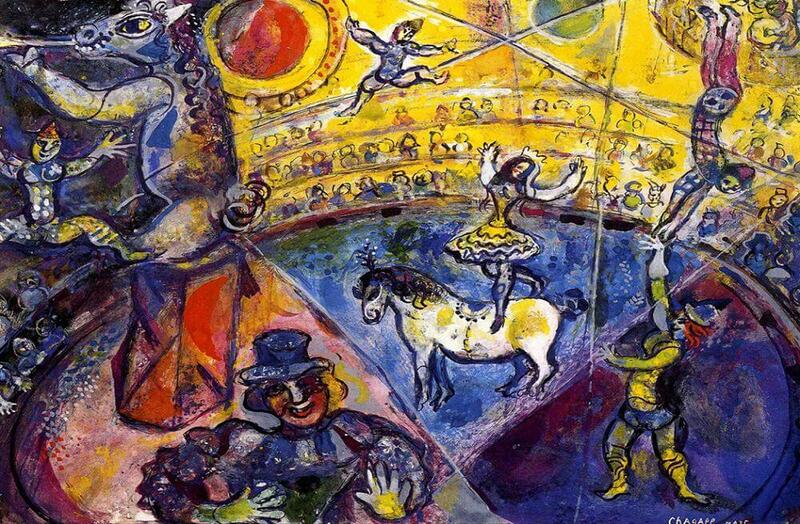 The unique style of Marc Chagall paintings has never been more evident than in the Circus Horse, 1964. The painting immerses the viewer in the hectic atmosphere that epitomized the early Russian circus. If there is one thing this painting has, it is vibrant color. Chagall has truly captured the bright, vibrant colors that are present at such an event. The audience is immersed in these background colors and become themselves, part of the mood. One can't help but feel the energy simply pouring out of the canvas, which is due almost exclusively to the use of dazzling hues and tones. The festive mood is furthered by the placement of the performers. At center ring is a woman riding an imaginatively colored horse, which provides a focal point to the painting. A wandering minstrel is present amongst the audience, which was a common occurrence in early circuses, as performers would often venture out into the crowd. The other predominant figure is the man holding the ring, ready for any sort of animal to jump through. One of the benefits of such a busy scene is that there are so many subtleties to be discovered. The bright colors allow this painting to be used as a focal point in almost any room, and the little nuances will pull viewers closer time and time again.